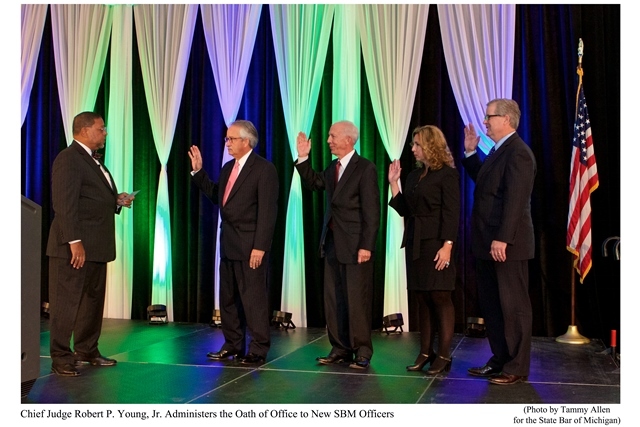 Dennis M. Barnes was sworn in as Treasurer of the State Bar of Michigan by Chief Justice Robert Young, Jr. at the State Bar of Michigan’s Annual Meeting on Thursday October 8, 2015. The State Bar’s election of Dennis to this officer position is not only a recognition of his leadership in the State Bar of Michigan, but also a recognition of his dedication to its primary purpose, protection of the public, and its mission, promoting improvements in the administration of justice and advancements in jurisprudence, and in improving relations between the legal profession and the public. Dennis was initially elected to the State Bar Board of Commissioners in 2010, and has served on its Executive Committee since 2012. Dennis has served in several different bar and professional organizations, and is a past-President of the Federal Bar Association’s Eastern District of Michigan Chapter. Not surprisingly, Dennis also has an active record of service to the community, serving several charitable and community organizations in a wide variety of positions. Dennis concentrates his practice on complex business litigation, including professional liability defense, insurance coverage litigation, intellectual property disputes, and other business tort and contract disputes. In addition, he has become a go-to mediator, facilitator, and arbitrator sought out by lawyers, clients, and judges around the state when they want to resolve controversies outside of court. Dennis is a graduate of Notre Dame Law School, Hillsdale College, and Detroit Catholic Central High School.